Anyway, lest you think I'm a Lands' End publicist or something, back to rugby. My first real exposure to the game was by a feature article in one of their catalogs, describing the national team, their line of rugby shirts and how they manufacture the jerseys used by the U.S. national team, the Eagles, to high quality standards. Lands' End has the exclusive contract to supply the Eagles with jerseys, luggage and other clothing, and I think this is probably a good thing for U.S. Rugby, despite the fact that Lands' End is the only place you can buy an Eagles jersey. (Resulting in some grousing from other retailers.) The firm does a good business in the States and has a good reputation, not to mention wide (I think even worldwide) exposure through their catalogs. The awareness they create for rugby - which is sadly not one of the U.S.'s favorite games - is obvious. What was interesting to me about the coverage Lands' End gave to The Game were some inaccuracies, which I have also seen repeated in other rugby literature and publicity. Here's the copy that accompanies the picture of their jersey: "Wear it and you'll never want for durability. 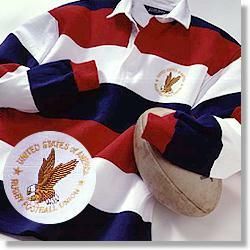 This is the actual jersey the USA Eagles wear, with 18 years of blood, sweat and tears built into it. (Just think how rough you can get with it!) But probably not more so than the players who wear it. Real rugby has no helmets. No pads. No time-outs. No substitutions. Just 2 brutal 40-minute halves of all-out action." Let's examine this for a minute. "No time outs." What, do they think players continue when concussed or something? That passes are made and caught with broken wrists? That play continues over the spinal cord-damaged bodies of front rowsmen lying helpless on the pitch? That players continue with the same wide-eyed and gory faces so common in photos (but not televised bouts) in wrestling magazines? Somebody needs to acquaint Lands' End with the concept of "injury time." "No substitutions." This may have been the case a few years ago, but I've been watching substitutions in televised international test rugby matches for the past year and have seen (and taken part in) club-level substitutions as well. And in Old Boy play, substitutions are not only common but expected! Finally, there's: "Please note: this jersey has a snug fit -- because loose fabric can give an opponent something to grab on to. (Hey, it's an authentic rugby shirt after all.)" I own two Lands' End rugby jerseys. After repeated washings they fit bigger and looser than the Maxmores I usually get for play and practice. Why? They're pre-shrunk, unlike the Maxmores! I bought a truly odd Lands' End jersey at a sale at my local supplier's a few weekends ago. I only paid $10 for it, an outstanding deal. It has three black and white stripes down the arms like an Adidas ("All Day I Dream About Scrums") jacket, and the characteristic Maxmore oval stitching at the base of the collar - suggesting that Maxmore made it for Lands' End. The funny thing is, my two daughters want the jersey. My youngest, in equipping herself for the neighborhood rollerblade-dance team, has taken to running a strip of masking tape down her arms and marking it with an indelible black felt pen to emulate the Adidas design. This is the first time in my entire life I have ever bought an article of clothing that a female has found desirable!